Oil Prices Drive HICP to Target...Will They Stay There? Where Will They Drive the ECB? The most noticeable thing about this month’s jump in the HICP is that it is abrupt everywhere. Inflation this month owes a good deal of its jump to hopping-hot oil prices. While the ECB headline rate at 1.9% must be construed as at its target of ‘close to but a little less than 2%,’ the core rate at 1.3% over 12 months is still well short of that goal. Inflation is heating up and we are seeing more widespread pressure, even though it is all basically from the same source, rising energy prices, the ECB tends to have a rather focused eye on the inflation rate per se. However, in this case, there is also the lagging core. And the core, while not the official target, has come to have some standing as an inflation gauge under the stewardship at the ECB of Mario Draghi. And while the core rate also rose in May, it is still below the HICP’s objective. The sequential calculations in the table show the HICP at 1.9% over 12 months, a 2.1% pace over six months, and a 2.9% pace over three months. This is a clear pattern of sequential acceleration. The core also shows such acceleration with the three-month pace up to 1.9%. Germany, France and Italy each show an accelerating inflation rate profile for their respective sequential rate of growths. Spain does not. Spanish inflation is at 2.1% over 12 months rising to a 2.7% pace over six months then dropping back to a 2.2% pace over three months. On a three-month basis, all four of the largest EMU members have inflation rising at a clearly excessive pace. Over six months, three of four (not Italy) also demonstrate this phenomenon of an inflation rate at or above 2%. For core or ex-energy inflation (in the case of Germany), we have two countries to inspect: Germany (ex- energy CPI based inflation) and Italy which does produce a flash on the HICP core. Both of these indexes show inflation rising from 12-month to six-month to three-month. Germany culminates in a three-month inflation rate at 2.2% which is over the top; Italy culminates in a rate at 2% which is a slight technical violation of the just less than 2% rule. However, on the longer, 12-month horizon, both Germany and Italy still show core inflation below the key 2% pace. Of course, given these trends and the local German trend, we can expect more concern about rising inflation among Germans and from other hard money centers in the EMU. But it seems clear that the bulge in oil prices creates a lot of this mischief and the inflation rate may not be able to hold at this pace. Already oil prices are backing off recent highs and there are concerns about the sustainability of the Saudi/Russian and OPEC production caps continuing in the future. If oil prices roll back, a lot of this inflation damage will too. A second interesting report today is the release of the monthly unemployment data. On that score, the EMU-wide rate of unemployment fell to its lowest mark since 2008. 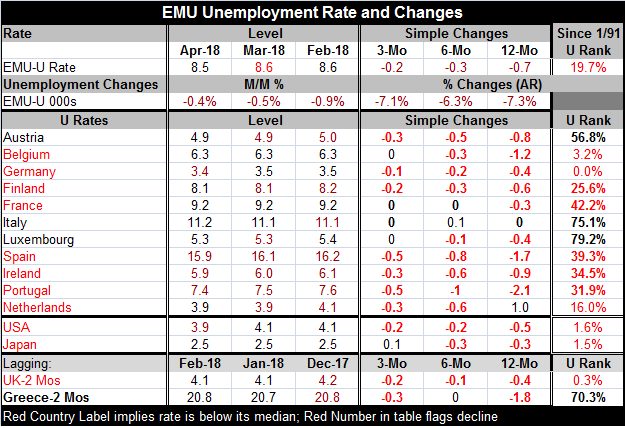 So the EMU is experiencing an inflation rate near its target with some momentum in play as its unemployment rate is falling to about its decade low. It all sounds impressive. Even so, the unemployment situation still appears to be a work-in-progress. The EMU unemployment rate ranks in the lower 20th percentile among all monthly observations since 1991. The U.S. rate is in its low two percentile on this timeline along with Japan. The U.K. has a rate that has been this low or lower only 0.3% of the time. The perceptions of an extremely low unemployment rate in Europe come from Germany where a new reunification low of 3.4% has been logged. The rate in Belgium has been this low or lower 3.2% of the time and the Dutch rate of 3.9% has been this low or lower 16% of the time. On the other hand, Finland’s rate has been lower one-quarter of the time. But for Portugal, Ireland, Spain and France, we are talking about unemployment rates that stand in their respective 30th to 40th percentiles. Austria’s low-seeming 4.9% rate has been lower 56.8% of the time. Italy, Luxembourg and Greece have rates that have been lower 70% to 79% of the time. In short, very little of the EMU area seems to have a stretched labor market and that is if we judge each market by its own historic (relative) standards. The uneven performance of unemployment rates within Europe are the reason why the German rate can be at a historic low reading and yet the EMU itself has a rank standing of its unemployment rate only around its 20th percentile. European policy-makers have to decide just what sort of policy environment they are in. And it is not just the inflation rate vs. the unemployment rate; it is also this new budding crisis in Italy with its impact on market rates and confidence. So far, the EMU has been run on German terms with the exception of the deviation that bank policy has taken under Mario Draghi in the pit of the recession/financial crisis. Even then, Mr. Draghi fought the Germans and other hard money types tooth and nail to get any policy flexibility at all for the ECB. And that infighting took so long that by the time Draghi won his point he had lost the match to the forces of economic chaos as the ECB’s actions came too late and were too little. So now, as there is some heating up, will the Germans and other hard money types try to reverse ECB policy on a dime to or will Draghi be able to hold them off as he waits to see if the new inflation benchmarks will hold? I do expect Draghi to hold the line for a while, but I’m not sure how much time he has if the headline stays hot and only the core remains lukewarm.